Nearly two thousand years ago, in the stark terrain where modern day Afghanistan and Pakistan meet, a sculptural tradition emerged that joins opulent forms and contemplative feelings and is unlike anything else in the history of world art. Although we know next to nothing about the sculptors who in the 2nd and 3rd Centuries CE developed what amounts to the first great act in the history of Buddhist art, a visitor to “The Buddhist Heritage of Pakistan: Art of Gandhara,” the exhibition now at Asia Society in New York, cannot fail to respond to the emotional texture of the work. Carving into dark gray schist, a stone with a dense materiality, these sculptors were giving shape to the Buddhist critique of materiality. There are scenes from the life of Siddhartha and standing and seated Buddhas, as well as themes drawn from Greek mythology and figures that suggest Prehistoric talismans. Despite the intimate relationship that these sculptors had with the classical forms of Greco-Roman art, their work exudes a wonderfully anti-classical fervor, a willingness to embrace confusions and pursue possibilities, to go where no artists had gone before. While I am reluctant to ascribe anything like a modern individualism to these anonymous ancient artists, there is a zest and a freedom to their carving that bespeaks an altogether familiar pleasure in the powers of invention. The image of Buddha is human, sensuous, unpredictable—not yet the gorgeously static abstraction of much later Chinese, Japanese, and Tibetan art. Originally slated to open last March, and for some months a victim of what Melissa Chiu, the director of the Asia Society Museum, has called “political turmoil and tensions in the U.S.-Pakistan relationship,” “The Art of Gandhara” will quite naturally leave some museumgoers thinking about matters of national identity, political change, and religious intolerance that have no immediate relationship with the works on display. Such thoughts are by no means irrelevant. It was in March, 2001 that the Taliban demolished two monumental 6th Century CE Buddhas, 121 and 180 feet high, carved into the live rock in Bamiyan. By dynamiting these gigantic Buddhas, which the Taliban dismissed as idols, the Islamic fundamentalists eradicated one of the wonders of the world and the last great architectural survivals of a lost civilization. I do not want to romanticize the ancient and alien cultures that gave birth to Gandharan art. But I do believe it is possible to see in the luxurious yet somehow ethereal images on display at Asia Society an openness to physicality, fantasy, and philosophizing that mocks the barren fanaticism the Taliban have imposed on the very same part of the world in our own supposedly enlightened times. It is true that the most scrupulous scholars of Gandharan art are often at a loss when it comes to knowing precisely where or when certain works were done, so that there is little hope of making many clear stylistic discriminations. Nevertheless, one can certainly see, in sculpture done over a period of two or three hundred years, a thrilling variety, with hieratic symmetries and architectonic structures living on something like easy terms with a taste for narrative intricacies and a flair for decorative caprice. Who can doubt that there is an experimental impulse lurking somewhere in the heart of Gandharan art? In a couple of marvelous fragments of capitals from the 2nd or 3rd Century CE, the stylized leaf forms on what amounts to a free variation on the Corinthian capital enclose a tiny figure of Buddha, who feels delicate and almost comical, a philosophical child in an exotic garden. Could it be that the artists who created these capitals had some sense that by dwarfing Buddha with this opulent display of fairy tale foliage they were giving visual expression to his relationship with a vast, strange, and estranging world? 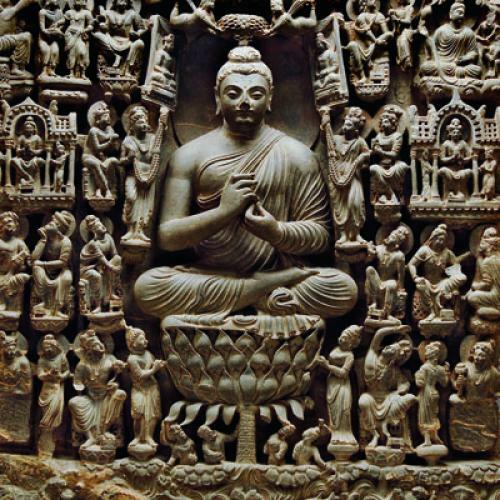 There is something in the inventiveness of Gandharan art that brings to mind Romanesque art, something about the variety of the forms and the spontaneity of the carving and the indifference to academic polish. Since the early twentieth century, art historians affected by the anti-classicism and expressionism of much modern art have been suggesting that the teachings of the Church helped to dissolve the classical perfection of Greco-Roman forms, pushing European sculpture and painting into the fresh, surprising, increasingly individualized avowals of the Romnesque and the Gothic. Could it be that the teachings of the Buddha pushed Gandharan artists to reformulate Mediterranean norms? Certainly the sculptors who created the work now on display at Asia Society evince an unexpected frankness when it comes to the actual weight and shape of the human body and the way people plant their feet firmly on the ground. Such honesty can feel disarming, even guileless, at least when compared to the formalized posturing of Greco-Roman art. The Goddess Hariti with Three Children—she was a demon who converted to Buddhism and became a personification of abundance and good fortune—exudes an easy, what-the-hell sensualism that confounds the neat, Grecian folds of her long dress. And many of the Buddhas are not so much spiritual beings as they are flesh-and-blood men, with sensuous lips, sleepy eyes, and the powerful torsos of philosopher warriors. While there is much about “The Buddhist Heritage of Pakistan: Art of Gandhara” that will feel alien to contemporary museumgoers, there is no reason to reject our own, strong impressions. The visitor who makes sense of Gandharan art in his or her idiosyncratic and even unabashedly ahistorical fashion is at least taking the leap of the imagination that the Taliban so brutally rejected by dismissing half a millennium of Gandharan art as idolatry and nothing more. For years now there have been intellectuals who argue that museums distort the products of far-flung civilizations by turning them into what we in the West regard as “sculptures” and “paintings,” categories some say are nothing more than an invention of the modern romantic (and maybe even colonial or imperialist) imagination. But those of us who dare to imagine that we understand something about Gandharan art are not necessarily claiming that it only exists in our terms, or asserting that we know what it meant to those who made it. I do not think we are wrong to sense in these dark, powerful statues an openness to experience that is not entirely alien. To allow materiality and spirituality to live side by side, if that is in fact what the Gandharan artists were able to do, is to set art on a path that finds distant echoes in the inimitable blendings of naturalism and symbolism forged in the late nineteenth century by Redon, Gauguin, and Van Gogh. By insisting on what is modern in Gandharan art we also seek to embrace something ancient in ourselves.